+1 (866) 385-4977 | Get A Free Brochure! Lusen multi-disciplinary media and design team develops outstanding interactive Video Walls and Video Wall Experiences that will amaze and inspire any audience. Lusens Interactive Video Solutions, Multi-Media Walls and specifically Touch and Gesture Interactive Video Walls create immersive user experiences that instantly engage your audience, immersing them in it and delivering an unforgettable experience. Our Video Walls are touch and gesture interactive and are created using multiple flat displays or projectors driven by powerful computers and players. Our LED Video walls and LCD Video walls react to touch, body motion and gestures. Lusens creates LED video walls and LCD video walls that react to touch, body tracking and gestures. Lusens Donor Recognition and Hall of Fame video walls are just examples of the many kinds of video walls Lusens designs and builds. Our digital and interactive video walls, deliver a most amazing multi-media video wall experiences that amaze, engage and entertain audiences. By integrating multiple ultra narrow bezel video wall quality monitors and digital screens, our digital video wall solutions are difficult to ignore. Lusens interactive wall displays are the kind of exhibits that bring spaces to life. Our video wall displays and video wall solutions immerse people in a multimedia experience that is unforgettable. 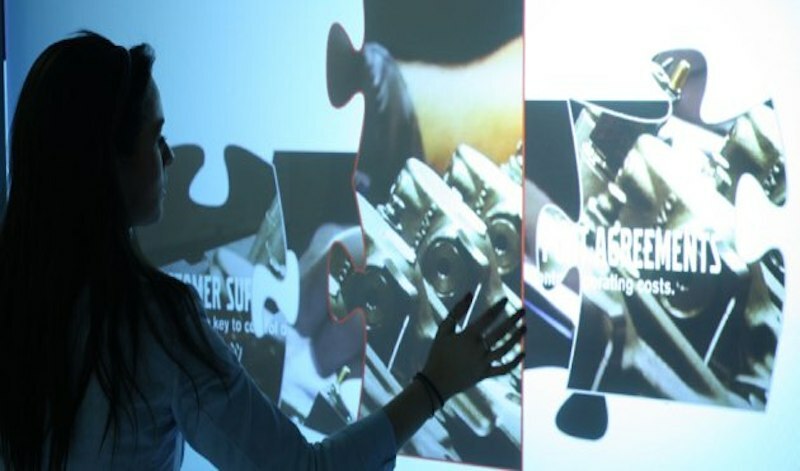 Projection video walls, are created by integrating digital projectors with sensors that track body motion and gestures. Lusens specializes in the creation of projection walls that are interactive and deliver most impressive body motion experiences. As oppose to video wall displays based in LCD or LED technologies, projected interactive walls converts existing walls into interactive digital video surfaces that stop people in their tracks. Lusens video wall and interactive wall solutions immerses and inspires while delivering an unforgettable experience. We create, design and build interactive immersive Video Wall experiences that blend with your environment and are driven by our high-performance interactive technology which is simple to use, modify and update. Our video walls and specifically, our interactive donor walls and donor recognition displays can be found at universities, hospitals, museums and other nonprofit organizations.